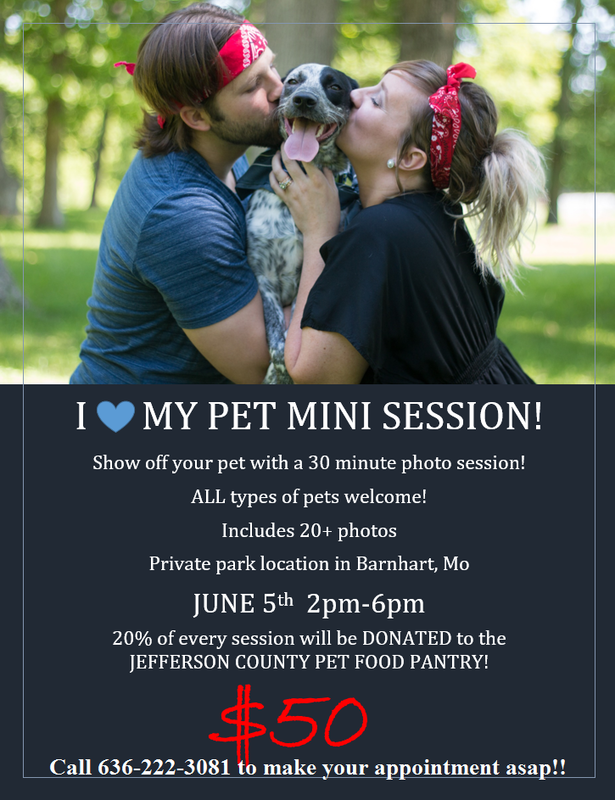 Jefferson County Pet Food Pantry : 30 Minute Pet Photo Session to Benefit JCPFP, ONLY $50!! 30 Minute Pet Photo Session to Benefit JCPFP, ONLY $50!! Our new friends at H+B Photography are doing their first ever Pet Mini Session Event! Bring your favorite animal friend and get some great family photos! 20% of their days total profits will be donated to Jefferson County Pet Food Pantry We are so excited they are doing this for us. Please like their page and get some wonderful family (with pets) pictures taken June 5th from 2-6 pm. Call 636-222-3081 NOW!